Is it possible to create an artistic atmosphere using all the elements of a good vermouth? Our friends at Artmosphere think so and show us just how in each and every issue of their magazine with its creative and highly original content inspired by contributions from different artists and accompanied by a very personal selection of author’s wines. Our Padró & Co. is a vermouth which embodies this double artistic essence: its content, highly ranked in tastings and encased in such a way to give it a unique presence. That’s why we are proud to have found a perfect tandem in the latest issue of the magazine: a fine vermouth in an exclusive publication. Being the authors ourselves of a rather special product, we know how to recognize creative talent and if there’s something they know about at Artmosphere, it’s talent. The combination of arabesques, the choice of colours and the oval label are the most representative aesthetic attributes of our vermouths, recognised for their packaging in the San Francisco World Spirits Competition (SFWSC), the most prestigious spirits competitions in the US. Without a doubt, Rojo Amargo, the most recent addition to the Padró & Co. range, is the most original in its presentation, with an exotic bottle style and cylindrical case with colours that change in ultraviolet light. In normal light, the copper colours prevail whilst in UV light, the fluorescent colours shine and become even more eye-catching. All the other vermouths follow the same packaging style: arabesques that evoke the plants, flowers and spices from which the vermouth is made; colours that reflect the close bond between each bottle and the vermouth inside it; and presentation in a vintage-style wooden crate that brings out the essence of tradition. 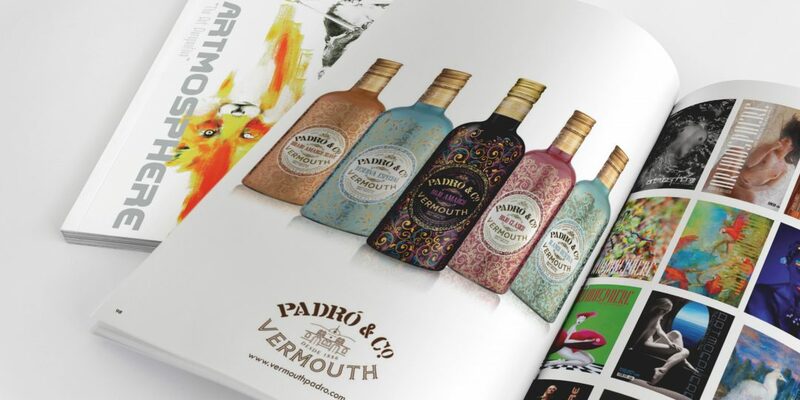 Art, aesthetics and gastronomy are ultimately what define our Padró & Co. vermouth. There is art in the alcoholic beverage itself; aesthetics in the design and presentation of the packaging; and gastronomy in the fact that these vermouths are the perfect complement for an aperitif, a good selection of Spanish tapas, a bit of cheese or even in a great cocktail.